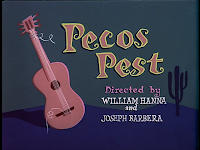 A memorable film from 1955 would be "Pecos Pest", if for nothing other than Uncle Peco's rendition of "Froggy went a-courtin'". Uncle Pecos pays Jerry a visit before his big tv debut. While demonstrating his country stylings, Peco's guitar string breaks. 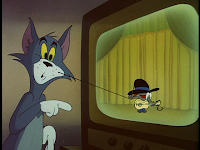 The western mouse (who's face is obscured by his mustache and hat) sees a replacement guitar string in the form of Tom's whisker. 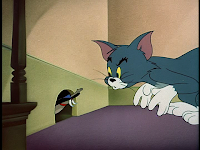 The rest of the cartoon deals with Pecos breaking guitar strings and hunting down Tom in order to rip another whisker from his face, with Jerry trying to protect his uncle from himself. 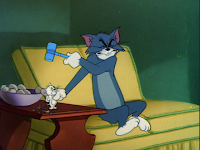 When at the mercy of Pecos weilding an axe, Tom finally surrenders and plucks his own whisker to give to the mouse, leaving him with only one left. During his tv performance, Pecos breaks another guitar string. 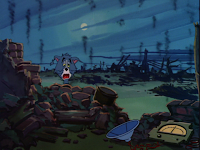 Tom's mocking laughter is cut short when Pecos reaches through the tv screen and plucks the feline's final whisker and finishes his song. 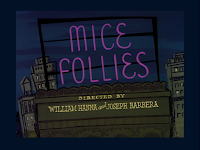 "Mice Follies" features one of the fastest freezing refrigerators of all time. Every mouse should have one for dealing with pesky cats. Jerry and Nibbles (or was he called Tuffy by this point in his career?) overflow the faucets in the kitchen, then freeze the water with the fridge to create an ice rink. Complete with a spotlight enhanced by multi-colored gelatin, the mice seem to have the perfect skating spot until Tom catches sight of them. 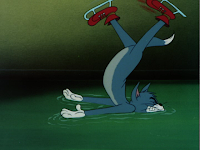 Tom is not as graceful as the mice and cannot keep his balance on the icy surface, leaving Jerry and Tuffy to simply wait while the cat exhausts himself while trying to stay upright. Tom soon shifts the odds (but only momentarily) when he finds some ice skates in the closet. Tom gets slammed into an inconveniently opened ironing board and is transformed into a living sled as he is squeezed beneath a door. The super-fast fridge comes in handy as Nibbles melts the ice, leaving Tom to take a dive into the water. 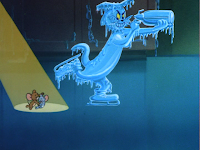 Now that the cat is soaked, Nibbles has only to use the powerful fridge once more to freeze the water with its incredible speed, creating a living ice sculpture out of Tom, who must watch helplessly as the mice covort around him. This reminds me...I need to defrost my fridge. 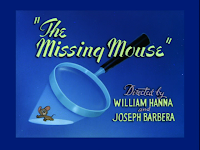 "The Missing Mouse" opens with Tom tormenting Jerry. We can already expect the mouse to get his revenge. 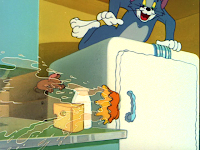 As a bottle of white ink falls on Jerry, a perfectly-timed radio announcement informs Tom that a white mouse has escaped from a laboratory. The mouse is filled with enough explosives to obliterate a city! 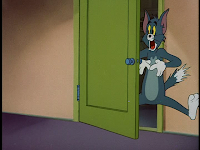 Since Jerry is already covered in white ink, it is the perfect chance to make Tom suffer. 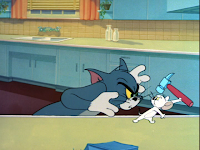 He threatens harm to himself repeatedly and Tom must put himself at risk to stop him, in order to prevent the explosion that the cat believes will occur. Once Jerry falls into the sink, the ink is washed off and the jig is up. 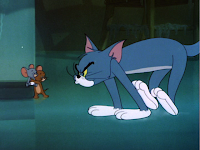 Tom boots the mouse out of the house...only to have the real white mouse arrive. 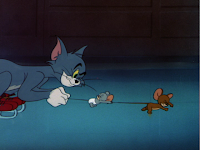 Tom manhandles the mouse, believing it is Jerry, but soon discovers that is actually the lab mouse. Thankfully, an update on the radio informs Tom that the lab mouse is no longer considered dangerous and that it will not explode. 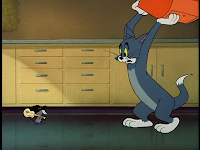 Tom kicks the mouse out of the house, only to have it...yep, that's right...explode. Radio announcer: "Repeat: the white mouse will not explode." Tom: "Don't you believe it!"